No. 4123 is one of the many hundreds of ‘4F’ class locos built by the Midland and LMS railways, and one of four in preservation. 4123 was constructed at the Crewe Works of the London, Midland and Scottish Railway Company in June 1925. It was initially allocated to Willesden shed in London where it performed its early work on the numerous loose-coupled goods trains which were worked in and out of London and the surrounding suburbs. In 1928 the loco was moved to Liverpool, based at that city’s Sutton Oak and Edge Hill sheds where it stayed until 1937, before returning again to Willesden. The second stay at Willesden was brief, and 4123 moved again to Toton in October 1938. Its work here consisted of shifting the considerable quantity of freight traffic handled by the yards there, including occasional appearances on the Brent coal traffic. In the 1940s, 4123 spent time at various LMS sheds, including Westhouses, Tilbury, Coalville and Leicester. In 1950, 4123, but now re-numbered as 44123, moved on to Gloucester (Barnwood) where it was used on both good and occasional passenger workings over the former Midland route between Bristol and Birmingham, as well as on freight over the Sharpness and Nailsworth branches. There are several recorded instances of it straying from this area – for example, in the summer of 1952 it was noted as piloting trains over the famous Somerset & Dorset line between Bath Green Park and Evercreech Junction, while in August 1953 it worked as far as Kettering and back with an excursion from Birmingham New Street. 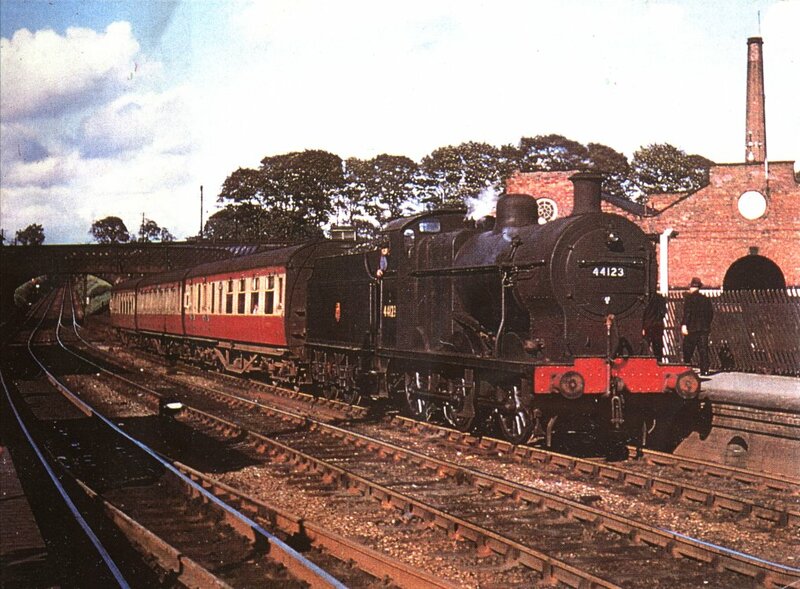 4123 was resident at Barnwood until April 1964, when it was transferred to the other shed in Gloucester, Horton Road, and from which it worked until its withdrawl from service in June 1965. Unlike almost all of its sister 4Fs locos, withdrawal from service was not the end of things for 4123, as it was fortunate enough to be purchased by Woodham Bros, and it was moved to their famous scrapyard at Barry. 4123 was to sit in Barry scrapyard for the next fifteen years, gradually rusting, and surrendering components to other locos. In December 1981 the loco was purchased by the London Midland Society, and moved to the newly formed Mid-Hants Railway at Ropley where initial restoration was commenced. In 1986 the London Midland Society left the Mid-Hants Railway, and the various items of rolling stock, including 4123, were moved to the Avon Valley Railway at Bitton, near Bristol, where the loco is still based, and where the restoration to working order is proceeding. May I point out that the Lickey Incline is not and never has been “In Birmingham” as described above. Ok – fixed it. Thanks for pointing it out. Great website despite the error. When will the donate button work? Thanks. Hopefully “south of Birmingham” is a sufficiently accurate description of the location of the Lickey. The donation button is now working! – please see the Donate menu at the top RHS.